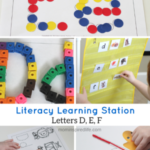 Our literacy learning station has been up and running for a week now and we worked on the letters A, B, and C. We had lots of fun learning the letter sounds! We are working on several letters each week since Evan already knows many of them and a lot of what we are doing is for review and extra practice. 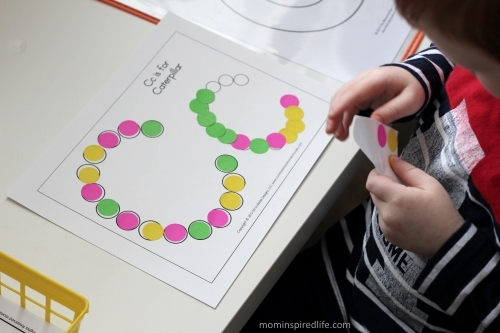 I am also trying to incorporate fine motor skills practice with the activities he does in the literacy learning station because he struggles a bit in that area. I took it fairly easy this week. 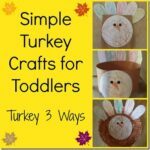 I wanted to ease Evan into our new routine and all the new printables we would be doing. I only print out the pages for the letters we are doing that week. I don’t print off all the letters at once. That is more manageable for me and allows me to change up what I am doing each week. 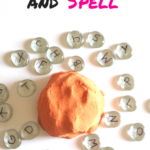 I created this really fun alphabet game called Letter Blast Off! and Evan LOVES it. 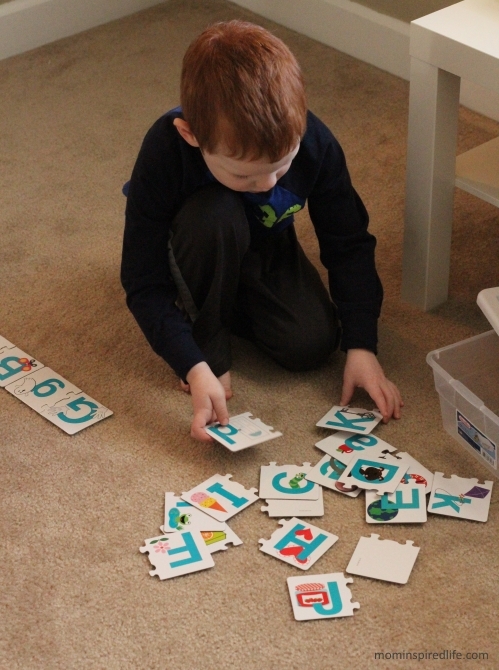 I made a game sheet for each letter as well as letter cards to add to our photo stacking blocks. You can get the free printable here. 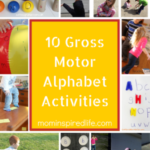 This is great for Evan because it gives him the chance to move and learn. 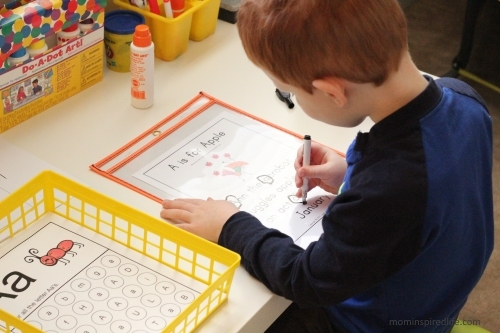 He throws and even kicks the blocks and then runs back to the learning station to dot the appropriate letter with his do a dot marker. I am so happy about how much he enjoys it! I printed out these block letter printables (lowercase and uppercase) on card stock and include them in the learning station each week. 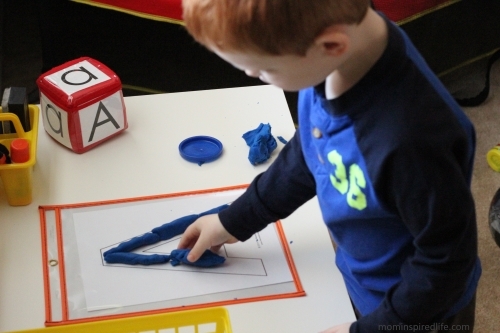 There are many ways you could use them, but Evan really likes to make play dough worms and trace the letters with them. I slide them into our write and wipe pockets and that way they can be used again and again. 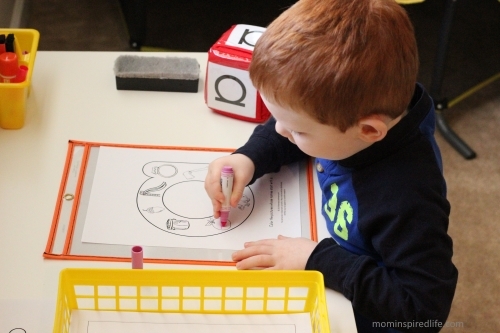 Evan really loves to color lately and these beginning sounds coloring sheets are a big hit with him. For additional motivation, I got some really neat pip squeak scented markers and they get him even more excited to do these sheets. I have him color all the correct pictures first and then I let him color the rest afterward. All week I included these ABC Letter Find pages. I also printed these on card stock so they will hold up to additional use by Evan and Alyssa. We used small foam blocks to cover the letters and colorful buttons. Evan really likes to do these letter hunt stories. I slide them into the write and wipe pockets, read the story to him and then he searches for the featured letter. When he finds one, he circles it with a dry-erase marker. These dot the letter sheets were also a big hit. 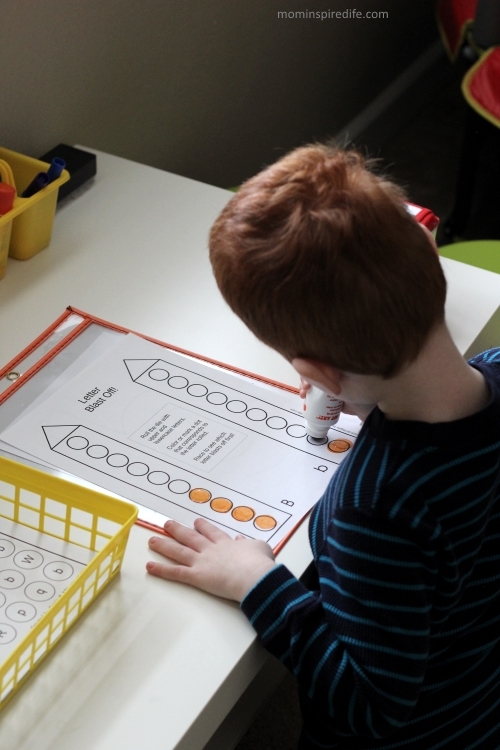 Evan enjoyed using do a dot markers and dot stickers on them. 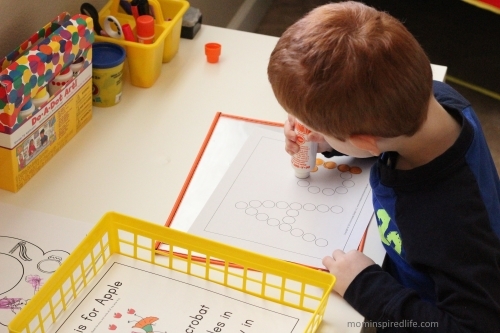 The dot stickers are really helping with his fine motor skills! 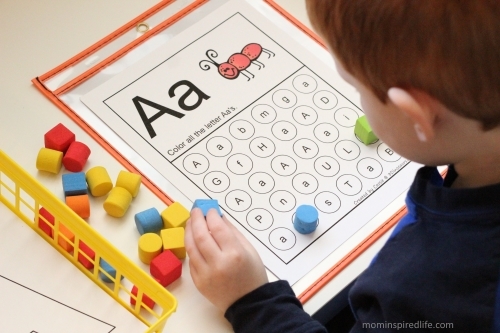 The learning tools I included in the literacy station this week were: lowercase/uppercase matching puzzles, lowercase/uppercase magnetic letters, alphabet peg puzzle and the Leapfrog fridge phonics toy. 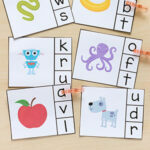 I hope this helps get you started on your journey to teach your child letter recognition and letter sounds! 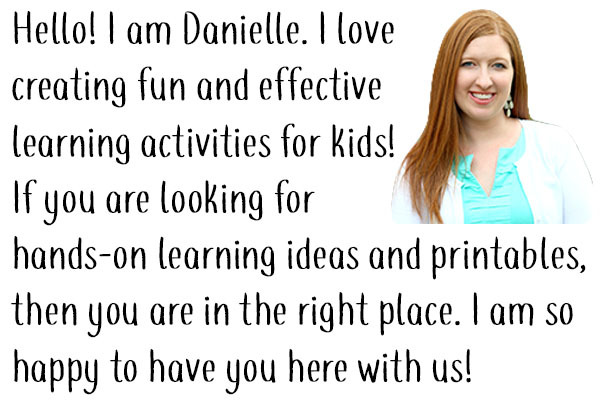 Next week I will be changing up the printables and the activities so be sure to check back for those. 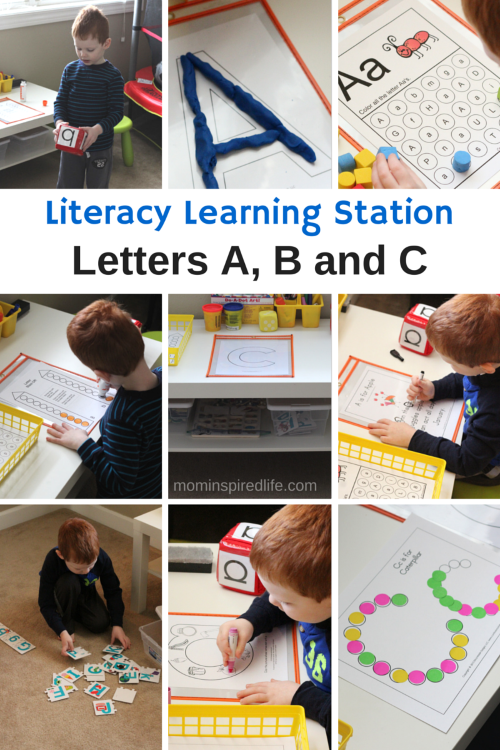 For additional information on how we set up our literacy learning stations, check out the posts below! 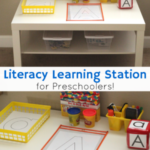 What is in the Literacy Learning Station?